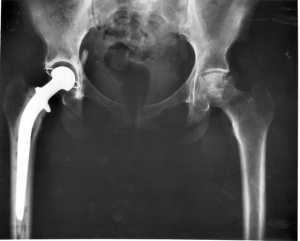 The main findings from our UK patient-level analysis indicated that joint replacement rates were not significantly different for users of TNF inhibitors versus the patients who remained only on conventional synthetic DMARDS, however we did find that TNF inhibitor use amongst older RA patients was associated with a 40% reduction in hip replacement rates. Response: Given the significantly lower rates of hip replacement observed among older RA patients on a TNF inhibitor, it would seem biologic therapies have a role to play in the reduction of joint replacement rates in rheumatoid arthritis, however the lack of an association overall and at other joints also highlights the need to consider other explanations for the stark trends of declining joint replacement rates for RA patients throughout the developed world. Response: Exploring the effect of therapy duration would be interesting and we definitely welcome the repetition our analyses using datasets from other countries in different health care settings from that of our own study. Disclosures: I would like to thank all co-authors of the study, notably Dr Daniel Prieto-Alhambra who supervised the investigation and is funding by an NIHR Clinician Scientist Award. I do not have any disclosures, although those of my co-authors can be found listed as part of the EULAR conference abstract. This entry was posted in Author Interviews, Orthopedics, Rheumatology and tagged EULAR18, hip replacements, joint replacements, knee replacements, medical research, orthopedics, rheumatology by Marie Benz MD FAAD. Bookmark the permalink.